Update your home without paying a fortune to do it. When you need a change of pace in your space, laminate flooring in Lansing, MI, from our showroom helps you transform the interior of your home. We offer a wide range of styles and colors in laminate floors so you can choose floor coverings that look just like hardwood plank or ceramic tile. Our laminate flooring starts at $1.49 per square foot. Our store provides you with attractive and durable flooring in the top brands from respected manufacturers. Laminate floors deliver a stylish and durable option that expands your design ideas in many ways. Our laminates help you broaden your decorating plans without forcing you to sacrifice the quality you want. The rustic charm of traditional hardwood is no longer beyond your budget when you take advantage of the affordable laminate wood flooring in our showroom. Experience a more luxurious look in your kitchen or living room by choosing from our vast inventory of laminate floor options. Our wood floors made from laminate create an atmosphere of warmth and comfort in any home and they withstand the busy foot traffic of day-to-day family life. This customer favorite allows you to get the most for your design dollar. It also offers creative ways to show off your design preferences. Discover the merits of wood laminate by talking to one of our friendly sales and design professionals. They are experts in flooring with extensive product knowledge, as well as design training. Let our professionals explain how laminate was created to be a versatile flooring option. These floor coverings were made to be strong, long-lasting, and so realistic looking. See the gorgeous details of wood in each and every laminate plank. Save time and money on your next kitchen or bathroom remodeling project with the stunning yet affordable selection of laminate tile flooring featured in our showroom. Your home improvement project can be completed in less time as well. Our laminate tile stand the test of time immediately impresses any guest visiting your home. Do not limit your design options when rejuvenating the interior of your home. Instead, choose from our vast assortment of colors and textures in laminate tile floors. Ask our sales and design professionals to show you samples of laminate that looks like ceramic, porcelain, or natural stone tile. It is impossible to tell the difference unless you are trying to hear your footsteps. Laminate is much quieter than tile so it contributes to a soothing atmosphere in a busy household. This innovative alternative to traditional flooring is expanding the design capabilities of families across our area. The laminate floors we offer are durable and easy to clean as well. Modernize the look and feel of your home by taking advantage of this economical and attractive flooring solution. These floors enhance the value and appeal of any room you love. Allow our sales and design professionals to help you find the perfect style at cost-effective pricing. 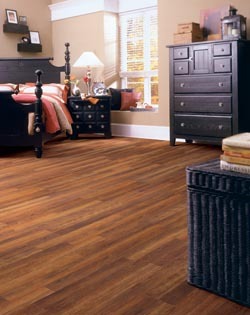 The beauty of this flooring option is that it has the authentic appearance of tile or hardwood, but at a lesser cost. Laminate is a sound financial choice for flooring that increases the beauty and value of your home. Laminate is manufactured flooring that is made to stand up to wear and tear and retain its attractive appearance. The manufacturing process is much improved so that laminate looks even more realistic than ever before. This flooring is made of layered construction that begins with a tough wear layer on the surface. This layer is clear so that you can see to the second layer, which consists of an image of a hardwood plank or ceramic tile. That is why this flooring looks just like wood or tile. You are actually looking at a high-resolution picture. Underneath this is the substrate layer, which makes this flooring stable and strong. On the very bottom is the backing, which protects from water. With all of this quality, is there any wonder that the demand for laminate is increasing steadily? Laminate flooring is prized for its installation versatility. There are limits to the rooms in which you can install wood or tile flooring. However, laminate has no such limits. You can place it in rooms with running water, such as the bathroom or kitchen, or in moisture-laden spaces, such as the basement. This flooring option is at home in all environments. From the moment you step through the doors of our showroom until your laminate flooring installation is complete, we work with you hand in hand throughout the entire process. We are focused on building a lasting relationship with you and your family, and our commitment to professional installation is part of that promise to you. We send only skilled and experienced technicians to your home. These professionals know exactly what to do to ensure the longevity of your flooring. We focus on your complete satisfaction. Our goal is to ensure your floors last a long time and provide years of lasting beauty. Take advantage of the value and style that our laminate flooring makes in your home. Ask about our special guarantees on our products and services when you visit us. Contact us today for an expansive selection of laminate flooring in every style and color imaginable. We proudly serve customers in Lansing, MI, as well as Okemos, East Lansing, Holt, Haslett, and the surrounding areas.